The history of ladies ski jumping is as old as the time when women went skiing for the first time. As for the men, for the women Norway is the origin country of ski jumping, too. Already in 1862 there should have been first attempts by Norwegian Ingrid Vestby in Trysil. In 1897 there were reports about 10 year old Ragna Pettersen who should have jumped 12 meters on Mesterbakken in Nydalen. 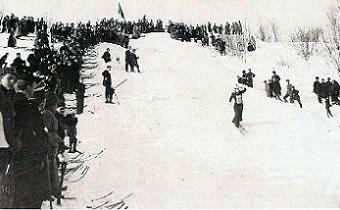 At the end of the 19th century the town of Asker not far from Oslo became famous for a few ladies competitions. 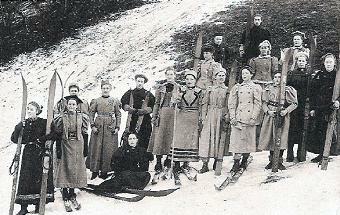 In the 20th century girls became more and more frequent on the ski jumping hills in other countries as well. 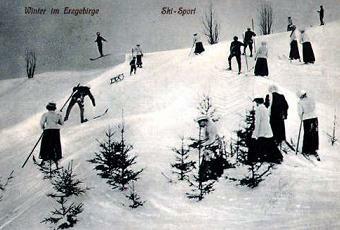 For example the English lady Hocking jumped 7 meters during the British ski championships in Switzerland in 1911. In the same year the noble countess Paula Lamberg from Kitzbühel jumped 22 meters and is said to be the pioneer of ski jumping women in Central Europe. Worth mentioning is also competition in Trondheim, where 28 Norwegian women supposed to participate in a competition on Gråkalbakken in March 1914. After World War I mademoiselle Engelbrecht from Munich became famous as a ski jumping Amazon and in 1927 Olga Balsted Eggen jumped 22 meters in Norway! From 1930 onwards the two ladies Hilda Braskerud and Johanne Kolstad from Dokka in Norway caught headlines by even winning junior competitions with male participants. During the annual competition on Midtstubakken in Oslo in 1931 they started non-competitive in front of an attendance of 9,000 spectators and were afterwards welcomed by crown prince and princess Olav and Märtha on the stands. Since the Norwegian ski association didn't allow official competitions of women, they had to jump betwenn the rounds and gained a very good reputation with their long jumps. 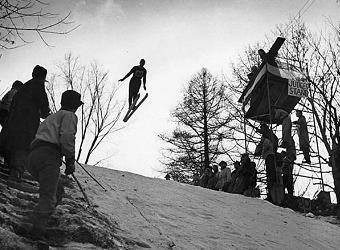 Between 1933 and 1938 Johanne Kolstad competed in Nort America on the most famous ski jumps on the U.S. and was celebrated by the media. A sensation was her jump on 72 meters in Berlin (New Hampshire) which meant an unofficial world record of ladies ski jumping. 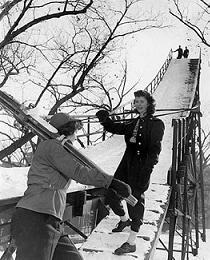 In the years before the beginning of World War II several Norwegian lady jumpers followed her example and competed in ski halls in London and New York and on other U.S. American ski jumping hills. With a jump of 70 meters Johanne Kolstad won her last competition in 1940 which was an Ladies Cup on Midtstubakken in Oslo. After World War II Anne-Lise Hexberg from Nittedal became famous as Norway's best ski jumper in mid 1950's. Afterwards the attempts of women to establish their sports stagnated for many years until Anita Wold from Trondheim came up in 1972 with a jump on 80 meters in Meldal and 97.5 meters in Sapporo in 1976. In 1981 Tiina Lehtola from Finland gathered attention with the first flight of a woman on more then 100 meters. While there were only few ski jumping women from Scandinavia in early 1990's, Eva Ganster from Austria showed that women can be good ski jumpers as well and became a lot of public attention with her jumps. Her performance provided the international break-through of this discipline. The FIS finally approved Ladies Grand Prix competitions in summer in 1999, later competitions in winter followed and the number of participants rose steadily. 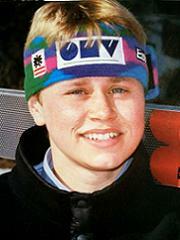 During the practising rounds for the Ski Flying World Cup in Bad Mitterndorf Daniela Iraschko cracked the 200 meter mark as a first woman on January 29, 2003. Meanwhile there have been annual national championships in all ski nations since 2001 and there is the Ladies Continetal Cup with its fixed placed in the winter sports calendar. With Norway, the USA, Austria and Germany many strong ski jumping ladies made their way into the world's top. 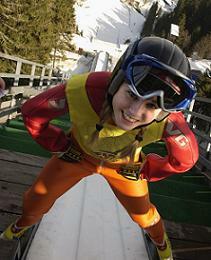 But many other nations follow their example and set up own teams of ski jumping ladies. 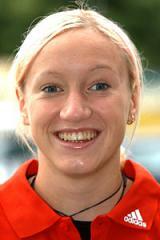 In 2009 the first World Champion will be figured out in Liberec for the first time. Although the discipline was rejected by the IOC for the 2010 Winter Olympics, it won't be possible to stop its development and the increase level of ski jumping women.